This is where it all started. PoopBags The Original is the best rated dog waste bag on Earth. It’s thick, silky-smooth, made from renewable resources, and it carries the highest rating of eco-friendliness for biodegradability and compostability of any product we offer. If you want the best, Made in the USA is important, and you are willing to pay a slight premium for it, PoopBags The Original is for you. 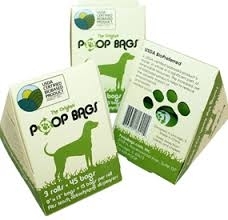 Pet waste bags meet USDA certification for Biobased product claims. Rolls fit most leash attachment dispensers. Each roll contains 15 bags (each 3 roll pack has 45 bags).